Spoil your friends or just pamper yourself with our heavenly guest soap. A triple-milled soap made with Evening Primrose Oil in the old French tradition. Rich and indulgent; it is gentle, smooth and creamy. 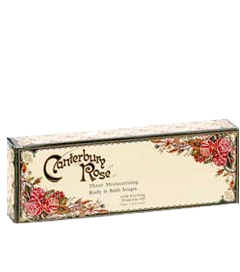 It will impart a lingering and beautiful Damask rose fragrance with subtle green highlights and musk. Each box contains 3 x 35g Soap.